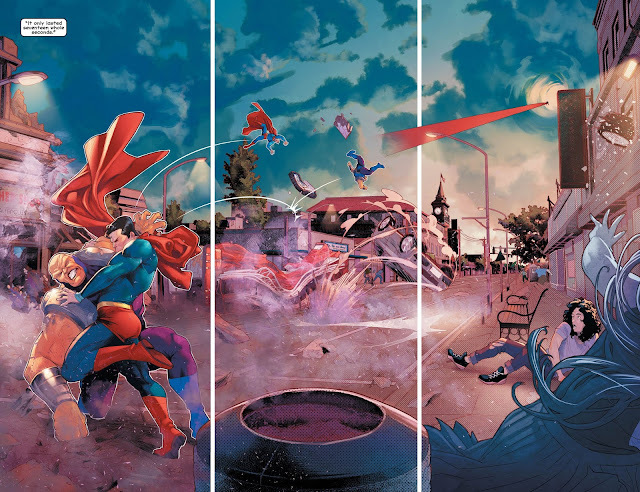 The issue opens with a huge and absolutely stunning battle between Superman and Mongul. I really mean it, the first couple pages look awesome and had me pumped to keep going. Unfortunately, this was the best part of the book by far. We are quickly "introduced" to Naomi and her friends and I put that in quotes because they are on the page, they are talking, but I had no idea who they were and who was actually doing the talking. One of the problems is the camera angle shifts way out so you can barely see the characters. It seems that is the case because of the huge amount of dialogue (which resembles a step ladder as it sing songs its way down the panels) which overpowers the art and does nothing at all to differentiate between the individual characters. It was such a disappointing way to set up a new series. The issue continues with Naomi at work, Naomi running out of work and hanging with her friends again...after missing Superman again. To continue the "agains", we again don't learn much of the characters except they love to yakety-yak. The poor setup continues as Naomi goes to her therapist (? ), hangs out with her tiny friends (at least they are tiny on the page), this time with a couple more that I know nothing about and then the issue ends with her finding out that the day she was adopted has a special meaning...one which her hometown wants to keep a secret. This is not a good issue in general and is a horrible first issue of a series. I didn't get anything to let me settle into this book, I know so little about Naomi herself and less about her friends. Everybody has the same voice and boy is it overused and the art starts off great but then makes you want to grab a magnifying glass to follow the rest. 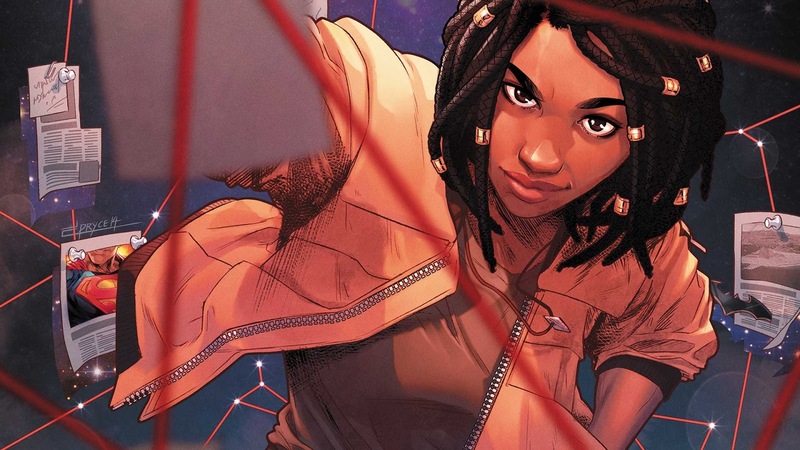 If the main goal of a first issue is to introduce you to the main characters and make you want to continue reading the story, this is an epic fail on both counts. 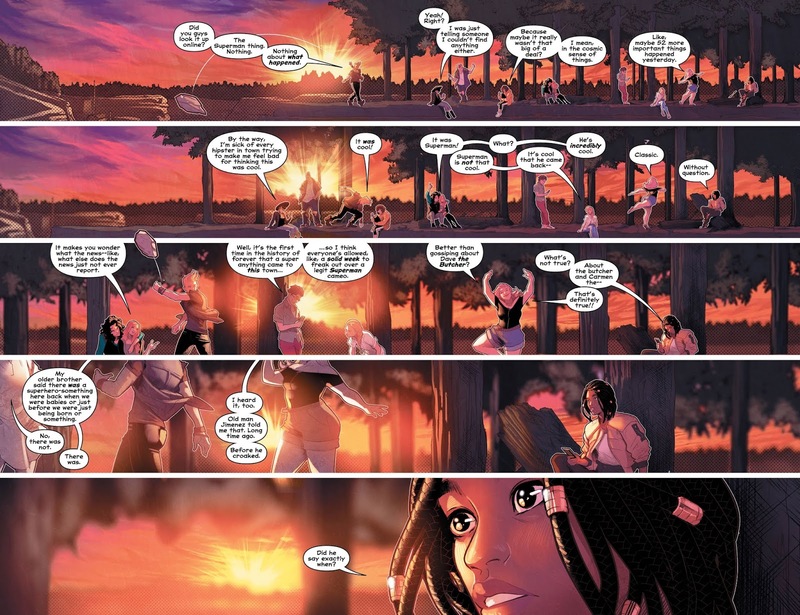 Naomi kicks off with a very talky issue that did little to make me care about the characters or the story. The art is fantastic in the beginning but seems to quickly get lost in an avalanche of word balloons. "The biggest mystery in the DC Universe" indeed! Interesting review. I think I pretty much disagree with everything except the fact that the Superman/Mongul battle looked awesome and the fact that not much happened. However, unlike you I think this actually worked in the book's favor. The fact that this five second "stop" in the battle between Superman and Mongul becomes the talk of the town and that everyone is totally ecstatic about it helps to establish the city and the characters. Sure they were all blown away by his appearance, but at the same time I actually think that Bendis, Walker and Campbell managed to give each character a voice of their own. Yes, there were similarities in the way they react and overreact, but it not really that much unlike how young people act these days. It's like you NEED to overreact these days, especially when you look at social media. The page you show as an example of how it was hard to distinguish between the characters is actually one of my favorites (aside from the fact that I'm not totally liking the white outlines, even though I get they are needed or they would indeed drown out in the scenery). I think if the mystery had come into play earlier in the issue much of the "world building" of the issue would have been lost and the town wouldn't really have stood out in any way, so personally I think it was a good choice to wait until the very end to tease the big mystery. Future issues need to speed up the pace somewhat though or I doubt the series will have much of a chance to really take off, but as a first issue I think it worked extremely well and for a book I didn't really have any expectations for it is now a book I will be eagerly awaiting future issues of to see what is going to happen. the pages were just the preview pages that DC sent so it wasn't planned to prove a point. I have no idea about anything and anyone in this town. I understand this is part of the mystery, but I couldn't tell you anything much about anything. 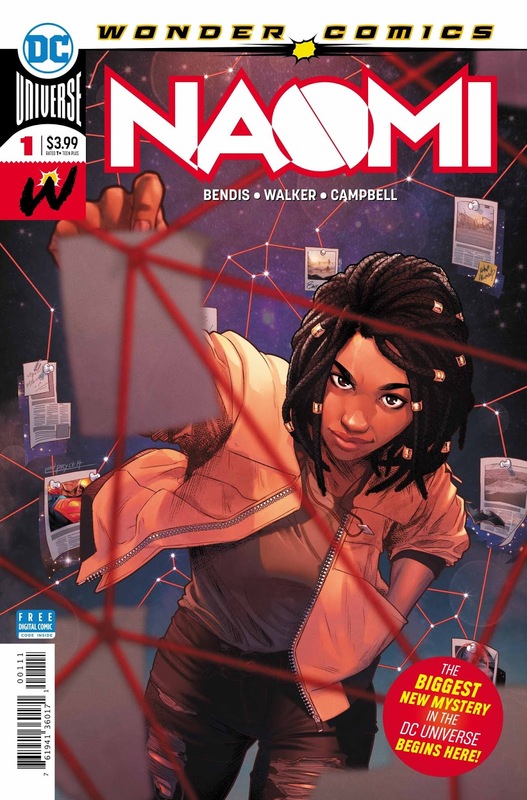 Hopefully the next issue shows Naomi's parents, gives me an idea of what her friends are like aside from talking the same as everyone else and what Naomi is like besides loving Superman and always being late. DC and Brian Michael Bendis have said that this book is the most important thing happening in the DCU right now and who Naomi is will change the Future of DC Comics...I don't see it yet. I enjoyed reading the first issue of this new series. The bits with Superman were equally intriguing.